Mushroom Beach: this is the main harbour for the island. Trivia: once upon a time the people of Bali used to consider these islands as a source of black magic and banish their least desirable to here. 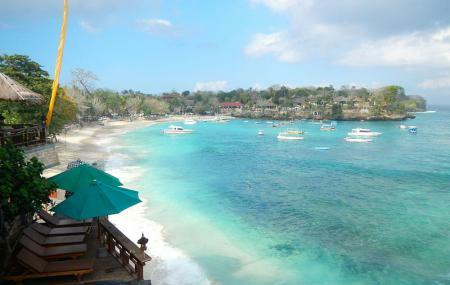 Also, visit the popular attractions in the city by following Bali itinerary 3 days. Boat tickets can be checked and booked at Gilibookings or Gilitickets. There are no gas stations on this island. Gasoline for your motorcycle must be purchased by the bottle on the street. Day trippers from Bali usually head back between 2pm and 3pm. Take a boat from Sanur Beach at the end of Jalan Hangtuah. Other places to get onto a boat: Benoa Harbour, Padang Bai and Kusamba. From Nusa Penida, take boats from Toyapakeh or Buyuk Harbour. Charter boats can also be arranged. How popular is Nusa Lembongan Island? People normally club together Tanah Lot Temple and Ku De Ta while planning their visit to Nusa Lembongan Island. People also prefer to keep themselves free for an entire day while exploring Nusa Lembongan Island. Nice place for snorkeling, banana jump,.., friendly staff.